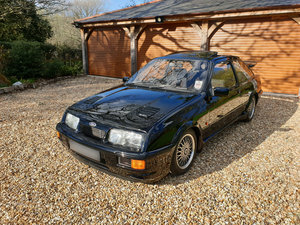 A Ford Sierra Sapphire Rouse Sport RS Cosworth with two owners and 32,076 miles. Integral front air dam, colour coded door mirrors, electrically adjustable and heated door mirrors, bonnet cooling vents, halogen headlamps, tinted glass, laminated ‘Quickclear’ windscreen and washer jets, central locking, leather gear knob and sports steering wheel, tilt and slide sunroof, graphic information module, electric front and rear windows. Factory options: 2008 Premium sound system, 2018 7-band graphic equaliser. Rouse Sport features: Garrett hybrid T25 turbo, reworked turbo system, induction and exhaust system, Rouse designed RS bodykit comprising of a RS500 front splitter, side skirts with flared sections to the rear doors, large rear spoiler, deeper rear valence, painted C-pillar trims, exterior silver Rouse Sport badgework, Rouse Sport Recaro seats, additional soundproofing, wider 225/50 ZR15 tyres, identification plaque. 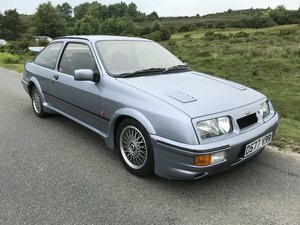 One of just 78 cars produced this rare Rouse Sport RS Cosworth is finished in desirable Ford Moonstone Blue, (Code 5 9) and is instantly recognised due to the unique body styling all correct and present. Extended sill panels, a front splitter and a lower rear valence are added to streamline the bodywork and give the car a lower and more purposeful appearance. 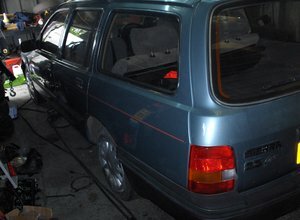 Additional moulding on the rear doors designed to direct airflow and clear the wider rear tyres and all Rouse Sport badges and stickers are attached. All panels show even gaps all-round and both front wings are date stamped. Headlamps are original Carello items and inside the fuel filler cap the notice to use ‘super unleaded or 4 star petrol only’ is still attached, only ever fitted to the Rouse Sport Cars. Incredible. Exclusive Recaro Rouse Sport Seats provide a higher degree of lateral support and driver comfort and are preserved thanks to the low 32,076 miles covered. 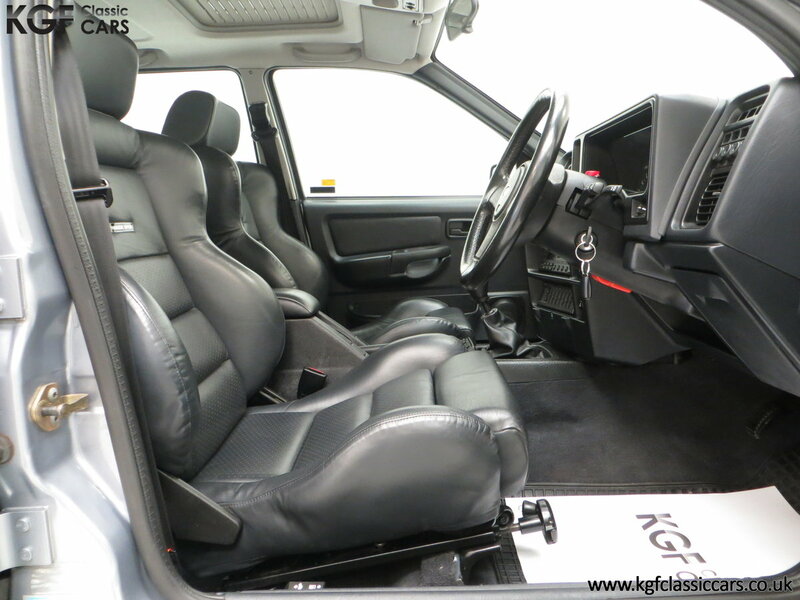 Door cards are pristine, undamaged and the immaculate carpets are protected by genuine Ford rubber waffle floor mats. The dashboard is completely free from any cracks and all incorporated switches and functions are intact and operate as they should. A phone kit has been removed with four filled holes in the passenger foot well and the radio is inoperative. 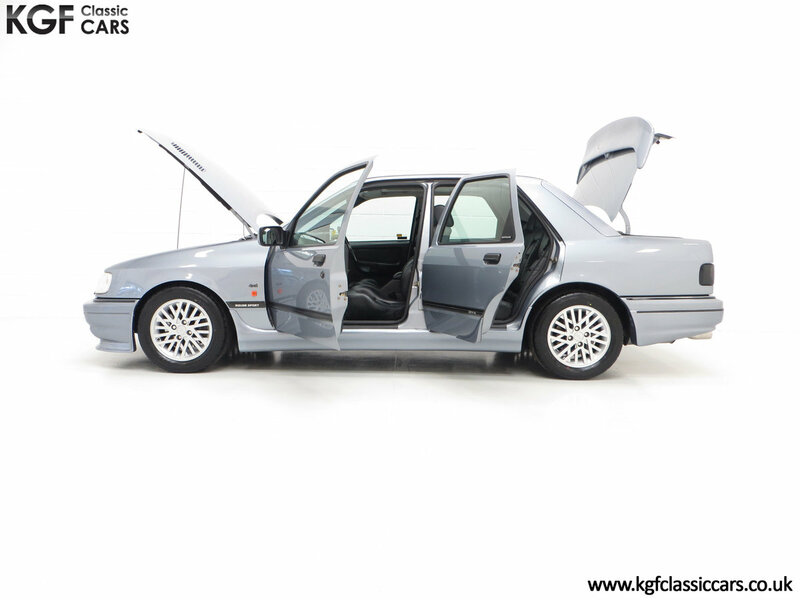 The Rouse Sport had double the sound proofing and at the bottom of the drivers B-pillar there is the blue-on-silver plaque listing the cars model, build number, chassis number and build date. There is also the dash mounted Rouse Sport badge and one to the rear still attached. Very special. This executive express was tuned for the road and many hours were spent on dynos to perfect the engine and management tweaks for everyday drivability by the experienced Rouse Sport team. 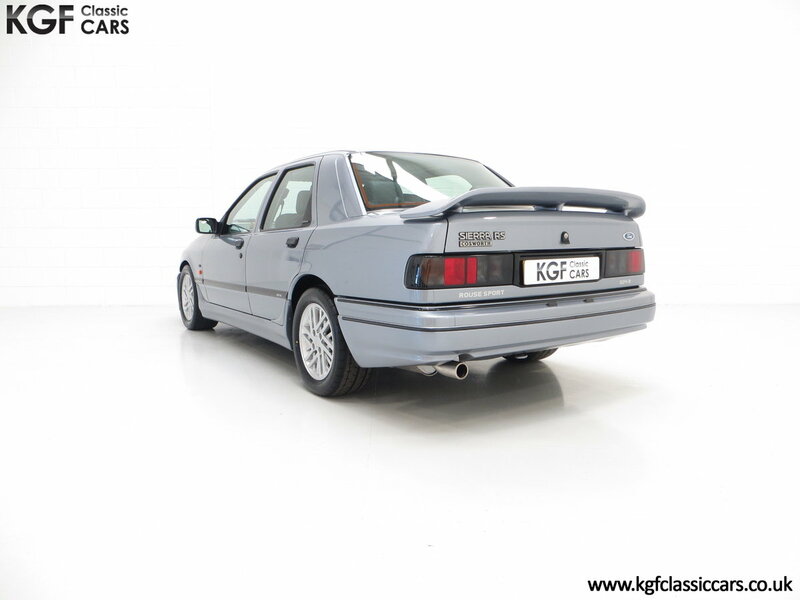 The figures are remarkable and the 1993cc Dual Over Head Cam (DOHC) Cosworth engine averages out a 28 per cent improvement across all performance measurements with 260bhp on tap. The blue-on-silver plaque on top of the timing belt cover, declaring ‘Rouse Sport use and recommend Shell Gemini 15W/50 oil’ is a reminder how special this car is and a recent full service and cambelt change was carried out by Cosworth Specialists, Harvey Gibbs and Supreme Car Services. The 5-speed MT75 transmission is reassuringly positive. An important alteration made by Andy Rouse for which the results were reckoned to be excellent are the swap from Fords standard Dunlop or Bridgestone 205/50 R15 tyres to 225/50 ZR15 tyres from Yokohama, the supplier to the Rouse race team and as newly fitted to this example. 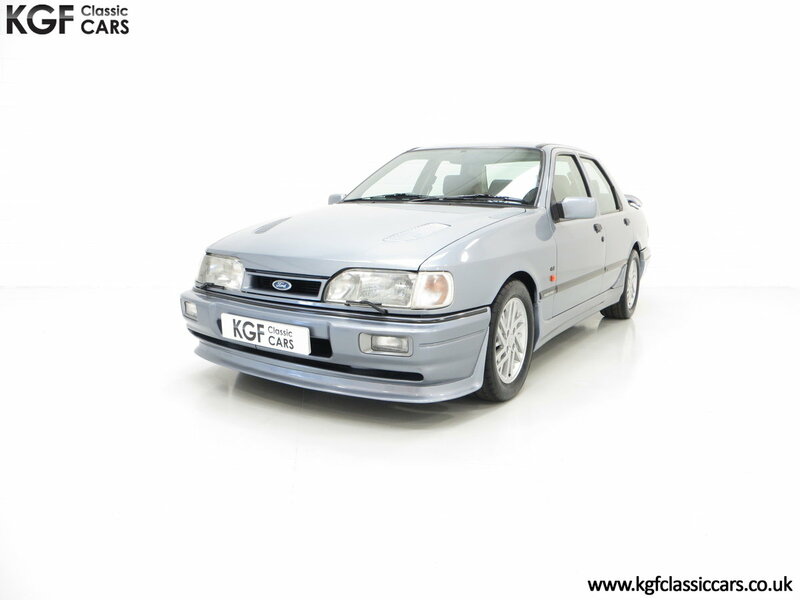 The factory fitted 15 X 7-inch RS Sierra Cosworth multi-spoke ‘Shark Tooth’ alloy wheels are in excellent condition. Diagonally split hydraulic, anti-lock braking assisted 278mm ventilated discs up front and 273mm discs at the rear bring the car to a halt quickly and safety. 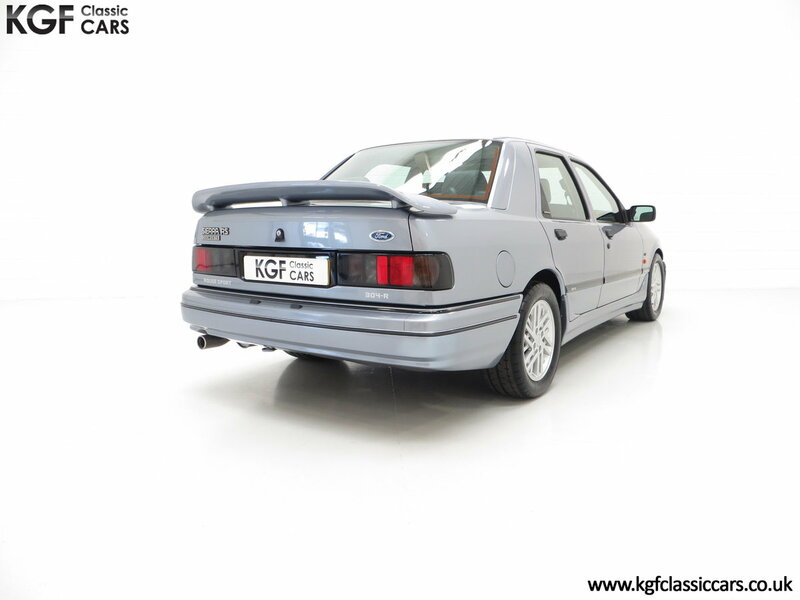 Built in June 1990 at the Genk Assembly Plant and supplied new by Ford Main Dealers and one of the official dealers responsible for retailing the Rouse Sport RS Cosworth, Crystal Ford Ltd of Hull on the 17th August 1990. 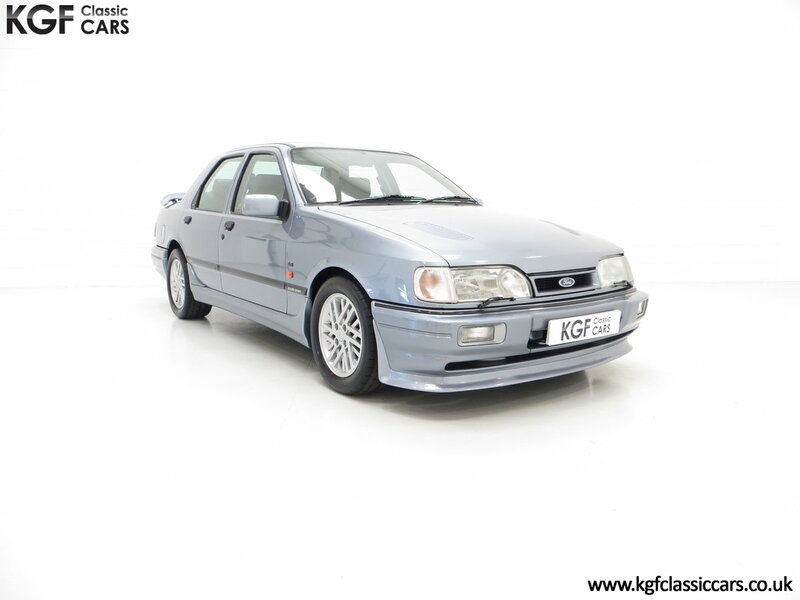 This example has had just two owners from new, CJ Worship & Co and Mr Grenard Silkscreen. Grenard purchased the car on the 7th February 1992 and has been the custodian ever since. 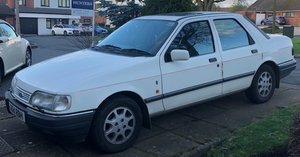 The vehicle comes with all handbooks, Rouse Sport supplements and virtually every MOT from when it was three years old. 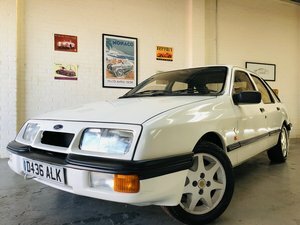 To prepare the car for sale it has just had a full service including gearbox and differential oils and a cambelt and water pump by Harvey Gibbs at Cosworth specialists, Supreme Car Services. A rare piece of automotive history. 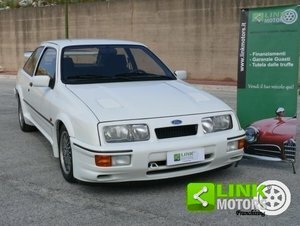 1989 Ford Sierra Sapphire 2000E DOHC.